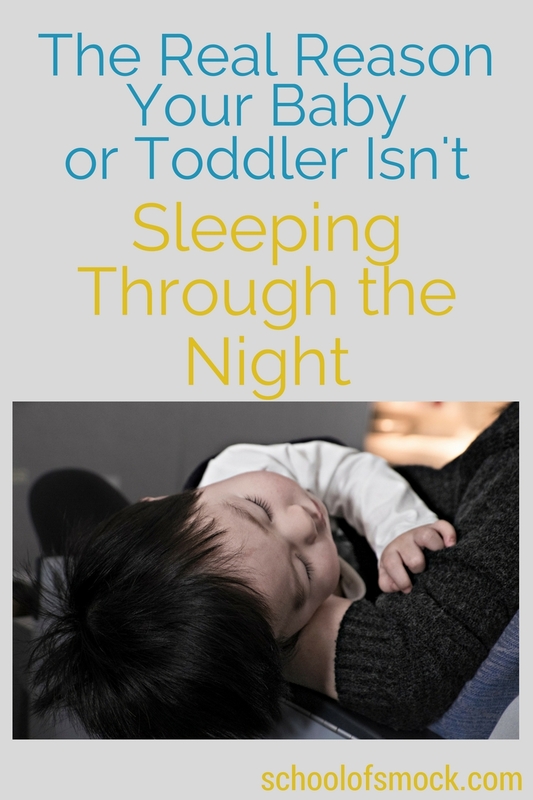 What if your toddler, preschooler, or baby isn’t sleeping through the night? Does your kid wake up again and again throughout the night? Are they unable to fall asleep on their own — at bedtime or throughout the night? Have well-intentioned people told you to put them to bed later, try lavender spray, play calming music, take them outside more during the day, and a million other tips that don’t really work? Or maybe you’ve just concluded that your baby is just a “bad sleeper,” and there’s nothing much you can do but wait it out. A sleep association is anything that a baby — or anyone, child or adult — needs to fall asleep. Sleep associations are not inherently bad. Personally, I need two flat pillows, total darkness, and ear plugs. If I woke up in the middle of the night, and my pillows or ear plugs had disappeared and all the lights in my room were on, I’d be suddenly wide awake and would have a hard time getting back to sleep. All of us wake up a lot during the night. We don’t remember nearly any of these partial awakenings. When you wake up for a second, you probably just roll over or pull up the blankets and have no memory of all the times you were a little bit awake. Babies, toddlers, and little kids are just like us. They wake up a bunch of times just a little bit. What parents think of as “great sleepers” are babies and kids who can get themselves back to sleep on their own, without adult intervention. They have positive sleep associations that they can easily recreate on their own in their own cribs or beds, such as cuddling a stuffed animal or blanket or sucking their fingers. My son, now five, had serious colic as a baby. We did anything to get him to sleep as a baby. The techniques that helped the most were bouncing on an exercise ball or walking around the house, rocking him at the same time. By the time he was four or five months old, we were exhausted from doing this at bedtime and again multiple times throughout the night. Also, the bouncing and rocking weren’t working as well anymore. (On the plus side, I did develop some serious ab muscles from all the bouncing.) Sometimes he would wake up and scream just 20 or 30 minutes later after being put down in his crib. The nights were endless cycles of waking up, bouncing, and rocking. Kids and babies who are “bad sleepers” have sleep associations that prevent them from getting back to sleep on their own. This is because they were soothed to sleep at bedtime (or at the start of a nap) under conditions that require the help of their parents. Again, when your baby is tiny, he can’t do this for himself: he needs your help to soothe himself. By the time a baby is somewhere around 4, 5, or 6 months old, he should be ready to start doing the soothing on his own. How do you encourage this if your child now depends on being fed, rocked, patted, or held to sleep? Start with your bedtime routine. Give your child a lovey. For both of my kids, lovey were indispensable parts of how they learned to sleep through the night on their own. Keep your bedtime routine simple, consistent, and calming. Your child’s bedtime routine should stay the same so that she learns to associate these simple steps of the routine with falling asleep. Make sure that your child has an early bedtime. Babies’ and toddlers’ brains and bodies are naturally programmed to go to bed early and rise early (boo to the early rising). Put your baby/child to bed before they are completely asleep. They should be relaxed and calm but still awake. Step 4 is the tough one, isn’t it? Yes, your child will in all likelihood cry. There are lots of sleep training techniques, and there is no scientific evidence that any of them will harm your child, in either the short-term or long-term. Choose a technique (I have had the best luck with the sort of a bit more gradual, a bit more gentle approach that The Happy Sleeper book describes), and stick with it. As with anything else in parenting, consistency is the key. What has been your experience with sleep associations? Which ones have been helpful or not helpful in your house? What have you done when your baby isn’t sleeping through the night?